If you ever broke 14 nails cleaning an oven, you’d know why I want this new self-cleaning one. They say the Kenmore self-cleaning oven even gets the corners clean. You just set the dials. It locks itself and everything. And you know what a horrible job it is cleaning under the burners? No, I guess you don’t. Anyway, with this stove you just flip up the top and give it a wipe. The automatic timer on the oven’s great too. It’ll cook dinner even if I’m out shopping or something. That stove’s really put together right. And another good thing, you can sure depend on Sears service. Honey, you’re about to own a new stove. We still frequently see this message–instead of getting men to share housework more equally, women should buy appliances that make their workload easier…and of course would need their husbands to pay for them. And then you should use it to cook for him, because that’s who it’s built for anyway. Also…14 nails? Like, she broke all 10, grew 4 more in real quick (or put on 4 fake ones), and then broke them too? Or was she somehow using her feet and some of them were toenails? Burk says that part of the ad makes women seem whiny and as though they exaggerate the difficulties of housework. I must be a disgusting human being, because the only time I ever worry about cleaning my oven is when I move out of a place I’m renting and have to if I want my deposit back. I’ve never noticed it being particularly disgusting, but then I put a tray under everything to catch drips. "If you ever broke 14 fingernails cleaning an oven, you might want to get your water tested for chemicals causing extra digits in humans." A few years ago, my mom bought a house built in 1949 and, having stayed in the family, it still had the original gas range and the original manuals. There was a "his" (installation, repair) and "hers" (operation). I wish I still had them! But apparently, you only have to go as far back as 71. Or, well, just watch a TV commercial today. My mom bought a house once that was built in 1949 and it still had the original Sears gas range AND the manuals that came with it. There was actually a "His" (installation, repair) and "Her's" (operation). 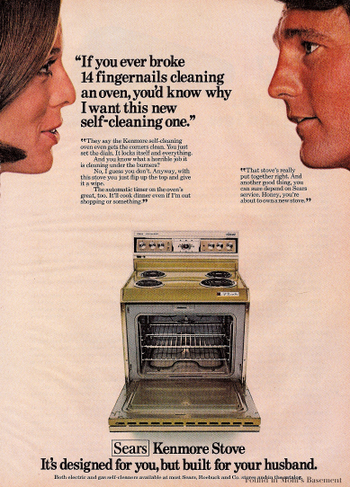 I so wish I still had them but apparently you only have to 1971 to see appliance-related sexism. Or you know...watch a TV commercial today. If you roast joints of meat in your oven, it will get disgusting pretty quickly. Not that most people do this very often any more, I don't suppose. Save yourself from Dengue Virus & Malaria Fever in Pakistan. Get Fumigation Service for Mosquitoes at reasonable charges with 2 to 3 months control Guarantee.